Everyone has that one (perhaps) odd food item that he or she could just eat excessive amounts of, but knows that it would be extremely weird to do so. For example, black olive juice. I love black olive juice…would drink it by the glassful if I could. But that would make me extremely weird, which I am…so I guess it makes sense. Or for some people that food obsession is peanut butter; just by the spooonful, or as a dip to almost anything. Well, another food item that I could probably live off of if given the opportunity would be cream cheese frosting. CREAM. CHEESE. FROSTING. Amen. I was bummed this past week to miss out on my mom’s baking of her unreal carrot cake with cream cheese frosting for my brother’s birthday. 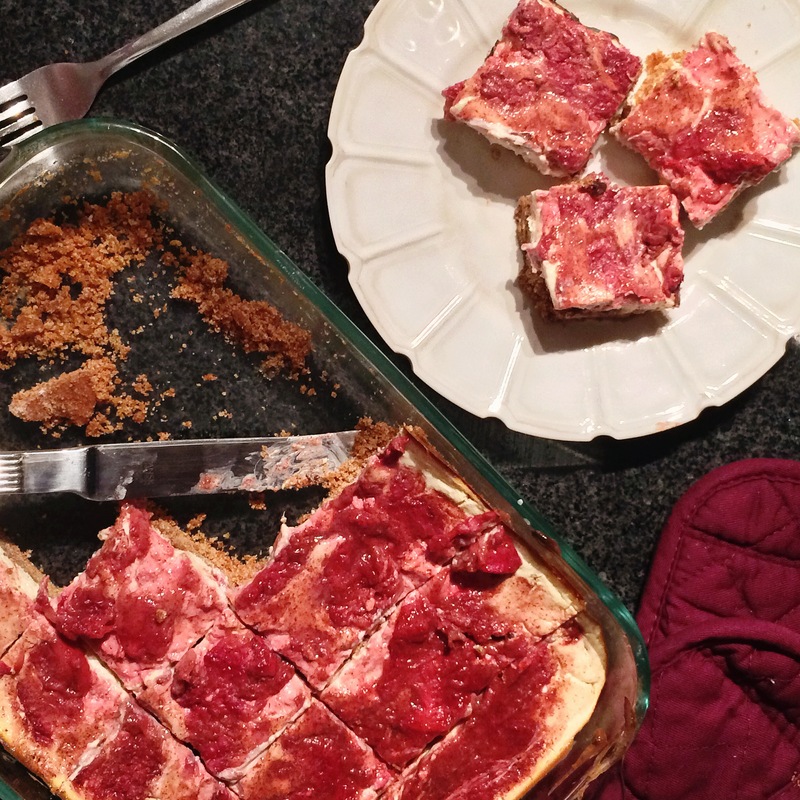 So, instead I decided to satisfy my cream cheese craving with simple and delicious Fresh Strawberry & Dark Chocolate Cheesecake bars. These bars are the perfect mid-day sweet treat so whip them up and enjoy them in the office, at home or at a summer get-together! Meanwhile, prepare the filling by mixing together cream cheese, egg, sugar and vanilla until combined. Remove crust from oven and let cool. In a small saucepan over medium heat, warm strawberries, honey and cinnamon. Once strawberries soften, begin pressing them with a fork to mush into a jam-like consistency. Unwrap 5 Dove dark chocolates, chop into smaller pieces and sprinkle atop crust. Then spoon cream cheese filling on top. Lastly, spread the strawberry mixture evenly on top of the filling and place in the oven for 30-35 minutes or until crust is slightly browned. Let sit in room temperature for 30 minutes and then place in the fridge to solidify overnight. 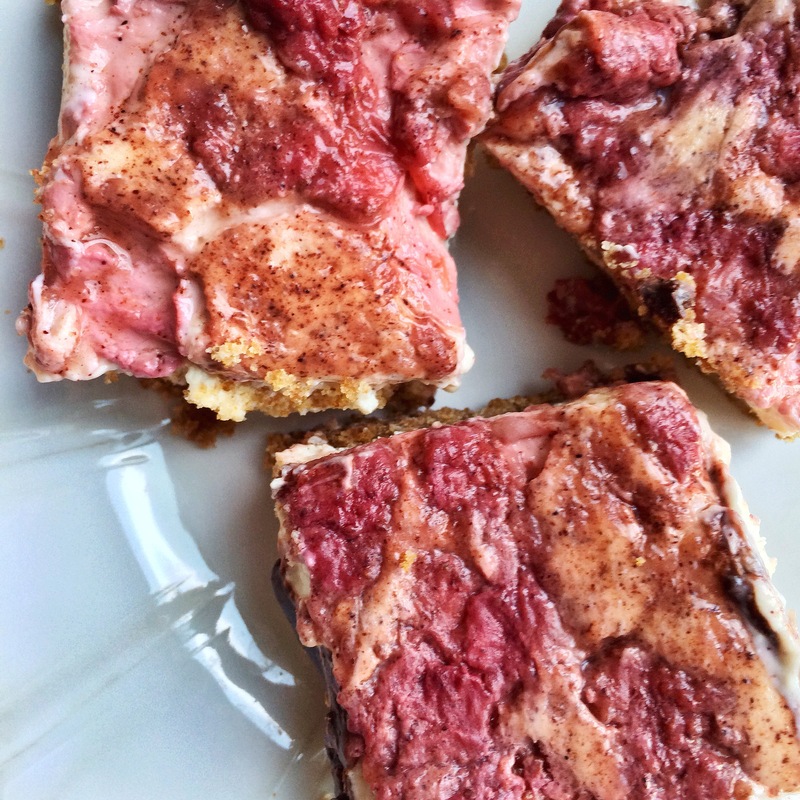 Cut into squares in the morning and Bon appétit!